This item is sold by Army of Angels. Paracord Bracelet - A very tough robust survival bracelet, hand woven using genuine 550 Paracord. Paracord is incredibly strong, with a breaking strain of around 250kg and is incredibly popular within the bushcraft and outdoor communities due to its versatility. Each bracelet can be unwoven to give a minimum of two 4 feet lengths of cord, each of which has 14 internal nylon threads that can be used for a huge variety of things form making snares to emergency tent repairs! Each bracelet is hand made and is fastened using an adjustable 5mm stainless steel shackle with a load rating of at least 100kg. These shackles mate with an adjustable section allowing you to alter the bracelet size for the most comfortable fit. There are numerous injured service men and women who are in need of immediate assistance. We want to help alleviate hardship for those individuals who can not seem to find help anywhere else. 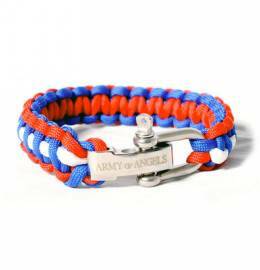 Buying this item, you are supporting Army of Angels. This item will be sent from United Kingdom.